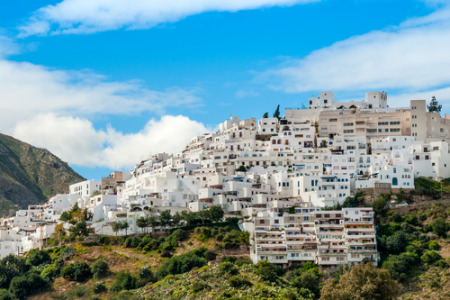 Mojacar holidays take you to an area of great scenic beauty on Spain's Costa Almeria. The town is clustered defensively round a hill overlooking the sea and offers wonderful panoramic views. Holidays to Mojacar can be taken at any time of year as the summers are long and hot and the winters mild. April to October brings most holidaymakers when the temperature rises from mid-twenty to the low thirties at the height of the season. The village itself is a little over a mile from the sea, but there is plenty of accommodation in Playa Mojacar by the beach. Holidays in Mojacar appeal to families and couples looking for a peaceful retreat in a friendly resort. With soft sandy beaches and secluded coves, it is no surprise that our cheap Mojacar holidays are snapped up quickly by families with young children. Mojacar holidays can be as relaxed or as energetic as you wish as there is a range of recreational activities to be enjoyed both in and out of the water. With good accommodation and restaurants catering for every taste, our low cost Mojacar holidays are sure to please. Shops and markets provide for all your essentials as well as gifts and souvenirs. Mojacar nightlife is relaxed reflecting the resort's popularity with families and couples. If you seeking a delightful corner of the Costa Almeria, with a guarantee of summer sun, you may be tempted by our Mojacar holidays offers. For further information and to view our best Mojacar holidays, please use the search facility.